For the opera, see Croesus (opera). Croesus (/ˈkriːsəs/ KREE-səs; Ancient Greek: Κροῖσος, Kroisos; 595 BC – c. 546 BC) was the king of Lydia who, according to Herodotus, reigned for 14 years: from 560 BC until his defeat by the Persian king Cyrus the Great in 546 BC (sometimes given as 547 BC). Croesus was renowned for his wealth; Herodotus and Pausanias noted that his gifts were preserved at Delphi. The fall of Croesus had a profound impact on the Greeks, providing a fixed point in their calendar. "By the fifth century at least," J. A. S. Evans has remarked, "Croesus had become a figure of myth, who stood outside the conventional restraints of chronology." Aside from a poetical account of Croesus on the pyre in Bacchylides (composed for Hiero of Syracuse, who won the chariot race at Olympia in 468), there are three classical accounts of Croesus: Herodotus presents the Lydian accounts of the conversation with Solon (Histories 1.29–.33), the tragedy of Croesus' son Atys (Histories 1.34–.45) and the fall of Croesus (Histories 1.85–.89); Xenophon instances Croesus in his panegyric fictionalized biography of Cyrus: Cyropaedia, 7.1; and Ctesias, whose account is also an encomium of Cyrus. Croesus is a descendant of Gyges, of the Myrmnadae Clan, who seized power when Gyges killed Candaules after Candaules's wife found out about a conspiracy to watch her disrobe, according to Herodotus. Reportedly, Croesus on the death of his father Alyattes faced a rival claimant to the throne in Pantaleon, son of Alyattes by a different mother. Croesus prevailed, and a number of the opposite faction were executed, and their property confiscated. As soon as his reign was secure, Croesus continued his sires' wars against the Asian Greeks, bringing all the Aeolian and Ionian Settlements on the coasts of Asia-Minor under Lydian rule, from whom he exacted tribute; However, he was willing to be friendly to European and Aegean Greeks, concluding various treaties with them, with Sparta, in particular, later in life. Croesus is credited with issuing the first true gold coins with a standardised purity for general circulation, the Croeseid (following on from his father Alyattes who invented minting with electrum coins). Indeed, the invention of coinage had passed into Greek society through Hermodike II. Hermodike II was likely one of Alyettes’ wives so may have been Croesus’ mother because the bull imagery on the croeseid symbolises the Hellenic Zeus -see Europa (consort of Zeus). Zeus, through Hercules, was the divine forefather of his family line. "While the pyre was burning, it is said that a cloud passed under Hercules and with a peal of thunder wafted him up to heaven. Thereafter he obtained immortality... by Omphale he had Agelaus, from whom the family of Croesus was descended..."
The dynasty which preceded that of Croesus on the throne of Sardes traced their descent from Alcaeus, the son of Hercules by Omphale, Queen of Lydia, during her year of required servitude. Like his ancestor Hercules, Croesus attempted to burn himself on a pyre when the Persians captured Sardes. By emulatinging the Greek myth, he demonstrated he had - or believed he had - Greek heritage. Moreover, the first coins were quite crude and made of electrum, a naturally occurring pale yellow alloy of gold and silver. The composition of these first coins was similar to alluvial deposits found in the silt of the Pactolus river (made famous by Midas), which ran through the Lydian capital, Sardis. Later coins, including some in the British Museum, were made from gold purified by heating with common salt to remove the silver. Than wolde a bare straw amonte. Than would a bare straw amount. According to Herodotus, Croesus encountered the Greek sage Solon and showed him his enormous wealth. Croesus, secure in his own wealth and happiness, asked Solon who the happiest man in the world was, and was disappointed by Solon's response that three had been happier than Croesus: Tellus, who died fighting for his country, and the brothers Kleobis and Biton who died peacefully in their sleep after their mother prayed for their perfect happiness because they had demonstrated filial piety by drawing her to a festival in an oxcart themselves. Solon goes on to explain that Croesus cannot be the happiest man because the fickleness of fortune means that the happiness of a man's life cannot be judged until after his death. Sure enough, Croesus' hubristic happiness was reversed by the tragic deaths of his accidentally-killed son and, according to Critias, his wife's suicide at the fall of Sardis, not to mention his defeat at the hands of the Persians. The interview is in the nature of a philosophical disquisition on the subject "Which man is happy?" It is legendary rather than historical. Thus the "happiness" of Croesus is presented as a moralistic exemplum of the fickleness of Tyche, a theme that gathered strength from the fourth century, revealing its late date. The story was later retold and elaborated by Ausonius in The Masque of the Seven Sages, in the Suda (entry "Μᾶλλον ὁ Φρύξ," which adds Aesop and the Seven Sages of Greece), and by Tolstoy in his short story "Croesus and Fate". There is bronze beneath it and with bronze it has been covered. 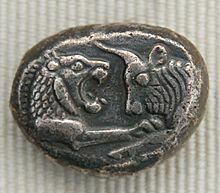 Silver croeseid issued by King Croesus of Lydia (561–545 BC), obverse: lion and bull protomes. The envoys wrote down the answer and returned to Sardis. Croesus read all the answers brought by his envoys from all the oracles. As soon as he read the answer of the Pythia he bowed, because he was persuaded that it was the only real oracle, along with that of Amphiaraus. Indeed, on the specific date Croesus had put pieces of a tortoise and lamb to boil together in a bronze cauldron, covered with a bronze lid. Then, Croesus wanted to thank and take on his side the oracle of Delphi. He sacrificed three thousand of all kinds of sacrificial animals. Then he lit a bonfire and burned precious objects. After the sacrifice he melted down gold and made golden blocks, each one 2.5 talents. He ordered his artists to make the copy of a lion out of pure gold, weighing ten talents. At the time of Herodotus this was situated at the Treasury of the Corinthians in Delphi, but 3.5 talents lighter, as the priests had melted down part of it. Croesus also sent along two enormous krateres (wine-mixing bowls), one made of gold and one made of silver, situated on one side and the other of the entrance to the temple of Apollo. After the fire which destroyed the temple, these krateres were transferred elsewhere: the golden one was transferred to the treasury of the Klazomenians, whereas the silver one was placed again in the vestibule of the new temple. Within this krater took place the mixing of water and wine during the Theophania. In Delphi they used to say that this one had been made by Theodorus of Samos. The votive offerings of Croesus comprised also four silver pithoi (storage jars), situated at the Treasury of the Corinthians, and two perirrhanteria (basins for purification water) made of precious metals and a statue of a woman made of gold; they said that it depicted the woman who kneaded Croesus' bread. Finally, he dedicated the pendants and belts of his wife as well as other simpler and smaller liturgical objects and a golden shield which he offered to the Archaic temple of Athena Pronaia, later on melted by the Phocians in the course of the Third Sacred War. According to legend, Croesus gave refuge at one point to the Phrygian prince Adrastus. Herodotus tells that Adrastus exiled himself to Lydia after accidentally killing his brother. Croesus later experienced a dream for which he took as prophecy in which Atys, his son and heir, would be killed by an iron spearhead. Taking precautions against this, Croesus kept his son from leading in military expeditions and fighting in any way. However, according to Herodotus, a wild boar began to ravage the neighboring province of Mysia, which soon begged Croesus to send a military expedition led by Atys to kill the boar. Croesus thought this would be safe for his son, as Atys would not be fighting an enemy that could throw a spear. However, he sent Adrastus with Atys as a bodyguard in case they would be waylaid by bandits on the expedition. While fighting the boar, Adrastus accidentally hit Atys with his spear, killing him. Croesus absolved Adrastus for his son's death; however, Adrastus later committed suicide. Croesus' uneasy relations with the Ionian Greeks obscures the larger fact that he was the last bastion of the Ionian cities against the increasing Persian power in Anatolia. He began preparing a campaign against Cyrus the Great of Persia. Before setting out, he turned to the Delphic oracle and the oracle of Amphiaraus to inquire whether he should pursue this campaign and whether he should also seek an alliance. The oracles answered, with typical ambiguity, that if Croesus attacked the Persians, he would destroy a great empire – this would become one of the most famous oracular statements from Delphi. The oracles also advised Croesus to find out which Greek state was most powerful and to ally himself with it. Croesus, now feeling secure, formed an alliance with Sparta in addition to those he had with Amasis II of Egypt and Nabonidus of Babylonia, and launched his campaign against the Persian Empire in 547 BC. (The scholar Evans in 1978 examines the conflicting dates implied in Herodotus.) Croesus was intercepted near the Halys River in central Anatolia and an inconclusive battle was fought at Pteria. It was the usual practice in those days for the armies to disband for winter and Croesus did so accordingly. Cyrus did not, however, and he attacked and defeated Croesus in Thymbria and later in Sardis, eventually capturing him. It became clear that the powerful empire destroyed by the war was Croesus's own. Croesus vanquished, standing in front of Cyrus. In Bacchylides' ode, Croesus with his wife and family mounted the funeral pyre, but before the flames could envelop the king, he was snatched up by Apollo and spirited away to the Hyperboreans. Herodotus tells us that in the Lydian account, Croesus was placed upon a great pyre by Cyrus' orders, for Cyrus wanted to see if any of the heavenly powers would appear to save him from being burned alive. The pile was set ablaze, and as Cyrus the Great watched he saw Croesus call out "Solon" three times. He asked the interpreters to find out why he said this word with such resignation and agony. The interpreters returned the answer that Solon had warned Croesus of the fickleness of good fortune (see Interview with Solon above). This touched Cyrus, who realized that he and Croesus were much the same man, and he bade the servants to quench the blazing fire as quickly as they could. They tried to do this, but the flames were not to be mastered. According to the story, Croesus called out to Apollo and prayed to him. The sky had been clear and the day without a breath of wind, but soon dark clouds gathered and a storm with rain of such violence that the flames were speedily extinguished. 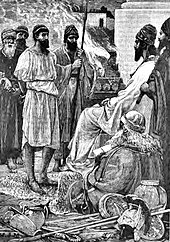 Cyrus, thus convinced that Croesus was a good man, made him an advisor who served Cyrus "well" and later Cyrus's son by Cassandane, Cambyses. 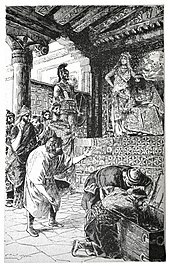 The Cambridge History of Iran argues that there is no evidence that Cyrus the Great killed Croesus, and in particular rejects the account of burning on a pyre. It interprets Bacchylides' narration as Croesus attempting suicide and then being saved by Cyrus. Recently, Stephanie West has argued that the historical Croesus did in fact die on the pyre, and that the stories of him as a wise advisor to the courts of Cyrus and Cambyses are purely legendary, showing similarities to the sayings of Ahiqar. After defeating Croesus, the Persians adopted gold as the main metal for their coins. 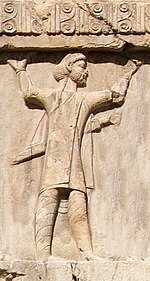 Lydian soldier in the Achaemenid army, following the Lydian defeat against the Achaemenid Empire. Xerxes I tomb, circa 480 BC. It is not known when exactly Croesus died, although it could be aligned with the traditional date for Cyrus' conquest of Lydia in 546 BC. 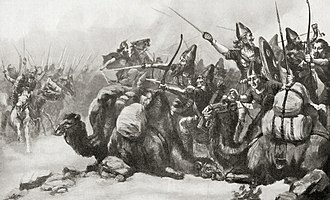 In the Nabonidus Chronicle it is said that Cyrus "marched against the country –, killed its king, took his possessions, put there a garrison of his own". Unfortunately, all that remains of the name of the country are traces of the first cuneiform sign. It has long been assumed that this sign should be LU, so that the country referred to would be Lydia, with Croesus as the king that was killed. However, J. Cargill has shown that this restoration was based upon wishful thinking rather than actual traces of the sign LU. Instead, J. Oelsner and R. Rollinger have both read the sign as Ú, which might imply a reference to Urartu. With Herodotus' account also being unreliable chronologically in this case, as J. A. S. Evans has demonstrated, this means that we currently have no way of dating the fall of Sardis; theoretically, it may even have taken place after the fall of Babylon in 539 BC. Evans also asks what happened after the episode at the pyre and suggests that "neither the Greeks nor the Babylonians knew what really happened to Croesus". Other literary examples are "Croesus and Fate", a short story by Leo Tolstoy that is a retelling of the account of Croesus as told by Herodotus and Plutarch; and "Crœsus, King of Lydia", a tragedy in five parts by Alfred Bate Richards, first published in 1845. ^ The English name Croesus comes from the Latin transliteration of the Greek Κροῖσος. ^ a b Evans, J. A. S. (October 1978). "What Happened to Croesus?". The Classical Journal. 74 (1): 34–40. JSTOR 3296933. examines the legend and the date 547 BC. ^ Herodotus credits his Lydian sources for the fall of Croesus in Histories 1.87. ^ Lost: what survives is a meager epitome by Photius. 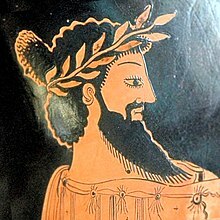 ^ Perseus 1:2.7 - http://data.perseus.org/citations/urn:cts:greekLit:tlg0548.tlg001.perseus-eng1:2.7 According to Hdt. 1.7 the dynasty which preceded that of Croesus on the throne of Sardes traced their descent from Alcaeus, the son of Herakles by a slave girl. It is a curious coincidence that Croesus, like his predecessor or ancestor Herakles, is said to have attempted to burn himself on a pyre when the Persians captured Sardes. See Bacch. 3.24-62, ed. Jebb. The tradition is supported by the representation of the scene on a red-figured vase, which may have been painted about forty years after the capture of Sardes and the death or captivity of Croesus. See Baumeister, Denkmäler des klassischen Altertums, ii.796, fig. 860. Compare Adonis, Attis, Osiris, 3rd ed. i.174ff. The Herakles whom Greek tradition associated with Omphale was probably an Oriental deity identical with the Sandan of Tarsus. See Adonis, Attis, Osiris, i.124ff. ^ "A History of the World-Episode 25 - Gold coin of Croesus". BBC British Museum. Archived from the original on 2010-02-27. ^ Herodotus, 1.49: "As to the reply which the Lydians received from the oracle of Amphiaraus when they had followed the due custom of the temple, I cannot say what it was, for nothing is recorded of it, except that Croesus believed that from this oracle too he had obtained a true answer." ^ Herodotus, Histories, Book I 34-45. ^ "L'alliance lydo-spartiate", in Ktèma, 39, 2014, p. 271-288. ^ Just such an intervention in extinguishing a funeral pyre was adapted by Christian hagiographers as a conventional literary topos in the martyrdom of saints. ^ Fisher, William Bayne; Gershevitch, I. (1968). The Cambridge History of Iran. Cambridge University Press. pp. 413–414. ISBN 9780521200912. ^ Stephanie West, "Croesus' Second Reprieve and Other Tales of the Persian Court", Classical Quarterly (n.s.) 53(2003): 416-437, esp. pp. 419-424. ^ "Gold coins - A Brief History". ^ The verb is "annihilate"; F. Cornelius, "Kroisos", Gymnasium 54 (1967:346–47) notes that the verb can also mean "destroy [as a military power]" as well as "kill". ^ J. Cargill, "The Nabonidus chronicle and the fall of Lydia: Consensus with feet of clay", American Journal of Ancient History 2 (1977:97-116). ^ J. Oelsner, "Review of R. Rollinger, Herodots babylonischer logos: Eine kritische Untersuchung der Glaubwürdigkeitsdiskussion (Innsbruck: Institut für Sprachwissenschaft 1993)", Archiv für Orientforschung 46/47 (1999/2000:378-80); R. Rollinger, "The Median "empire", the end of Urartu and Cyrus' the Great campaign in 547 BC (Nabonidus Chronicle II 16)", Ancient West & East 7 (2008:forthcoming). ^ Watts, Isaac (1762-01-01). Horae lyricae: poems, chiefly of the lyric kind ... /. New York : Printed and sold by Hugh Gaine. ^ "Horae Lyricae (Isaac Watts) - ChoralWiki". www2.cpdl.org. Retrieved 2016-12-20. Wikimedia Commons has media related to Croesus. Herodotus' account of Croesus; 1.6-94 (from the Perseus Project, containing links to both English and Greek versions). Croesus was the son of Alyattes and continued the conquest of Ionian cities of Asia Minor that his father had begun. Chisholm, Hugh, ed. (1911). "Croesus" . Encyclopædia Britannica (11th ed.). Cambridge University Press.